On Monday, activists rallied in front of City Hall to support legislation aimed at protecting tenants displaced by the Ellis Act. Sponsored by Supervisor David Campos, the legislation greatly increases Ellis Act relocation payments to tenants. Increased payments would make it easier for evicted tenants to find housing within San Francisco, and is a critical step while the city pushes for Ellis Act reform in Sacramento. The legislation will address the nominal relocation payments in effect. Currently, landlords must pay each evicted tenant $5,265, maxed at $15,795 per unit. An additional $3,510 must be paid to elderly or disabled tenants. The proposed legislation would greatly increase payments by forcing landlords to provide an amount reflective of market increases. Landlords will be required to pay for the difference between tenants’ current rental costs and market rates for two years. Examples cited during the hearing suggest that tenants could receive up to three times as much in payments. Campos believes the legislation will help mitigate the effects of evictions and also provide a disincentive for landlords in making Ellis Act evictions. Still with soaring rents in the City, the increased payments may still not be enough. A rally of over sixty residents and activists came out to support the legislation with groups like Causa Justa and South of Market Community Action Network represented. Speakers at the rally spoke of the impact of evictions and displacement to people of color and seniors. Patricia Kerman, a long-time resident of the Mission District, told her story of being threatened with an Ellis Act eviction as an elderly woman. Having spent the last 27 years living in the Mission, her landlord saw an opportunity to capitalize on the booming Mission real estate market. Her landlord offered her a buyout, but she refused to accept it. Like many others being evicted, Kerman said she would fight the eviction and would not be leaving her home. During the hearing, Supervisor Campos presented the plan to the Land Use and Economic Development Committee. “It is not the solution, but it gives them a fighting chance,” he continued. San Francisco currently has the highest rents in the country, and Campos believes that increasing relocation payments is vital in fighting this eviction crisis. The costs of rents in San Francisco have skyrocketed in recent years, with the median rental in the city being $3414 a month as of June 2013. The $5,265 tenants are eligible to receive is just not enough Campos said. Fellow supervisors offered their support for the legislation, but provided questions about how calculations for payments would be done and how “mom and pop” landlords would be affected. Campos presented additional amendments to the legislation that would address the formula used for the calculations, an appeal process for landlords, and a hardship adjustment for landlords. 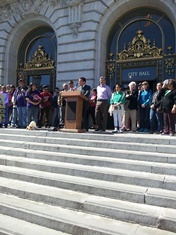 Supervisors and speakers called for greater statewide reform on the Ellis Act, saying this legislation is part of a longer and bigger struggle for tenants’ rights. “It is a modest adjustment to relocation. It is not the solution, but an important part of it,” Campos said. Erin McElroy, director of the Anti-Eviction Mapping Project, presented additional findings during comment on displaced tenants. In a survey of 171 people, around 40% have relocated in San Francisco and are paying an average increase of 82.8% in rent. McElroy said that 20% have left altogether and others were homeless or living in their cars. McElroy also spoke of the disproportionate Ellis Act eviction occurring between serial evictors and smaller “mom and pop” landlords. They found that 75% of Ellis Act evictions in 2013 were from within 5 years of ownership, suggesting that smaller “mom and pop” landlords were not seriously utilizing the Ellis Act but rather larger speculators. During public comment, speakers spoke of their experiences with being evicted, and called for the legislation to be passed as soon as possible. Sarah Grant, a teacher in the City, spoke of her and her 98-year-old neighbor’s eviction as well as her experiences with her fellow colleagues and students’ evictions. Toward the end of the hearing, a group of stand up comedians spoke, providing humor to what had been a tense period of comment. A rally held earlier in the day at the Superior Court emphasized the need for Ellis Act reform. Activists from Eviction Free San Francisco came out in support of Edwin Lindo and his father Edwin J. Lindo, who are facing an owner move-in eviction. At the rally, Lindo said that the landlord, if unsuccessful, would try to use the Ellis Act to evict them. The hearing will resume next week, where the Committee decides on whether to push it to the entire Board for a vote.